Having failed last November to make history as the first Latina elected to Texas statewide office, former state Sen. Leticia Van de Putte has another chance at scoring a milestone if she can survive a tight race for San Antonio mayor that has had its share of acrimony. Van de Putte faces the city's acting Mayor Ivy Taylor, in her quest to be the first Latina to head the nation's seventh most populated city with about 1.4 million people. Taylor replaced Julian Castro, now part of President Barack Obama's Cabinet as Department of Housing and Urban Development secretary. Taylor and Van de Putte survived a 14-candidate field in the non-partisan race to enter Saturday's runoff election. Eight days of early voting ended Tuesday, with more than 60,000 people casting their vote. The ensuing month of the runoff campaign made the race one that the Texas Tribune labeled "bruising." Picking up on a report in the San Antonio Express-News, Van de Putte questioned Taylor's ability to protect the city's safety, raising questions about whether Taylor's husband refused to cooperate with police investigations. "How can the citizens of San Antonio expect you to stand up for the safety of our families when you won't stand up for the safety of your own family," Van de Putte said at the debate. After the debate she offered her hand to Taylor and Taylor refused to shake it. Van de Putte's husband also was dragged into the race, when the San Antonio Express-News reported he had unpaid federal and local taxes, which he has since resolved. 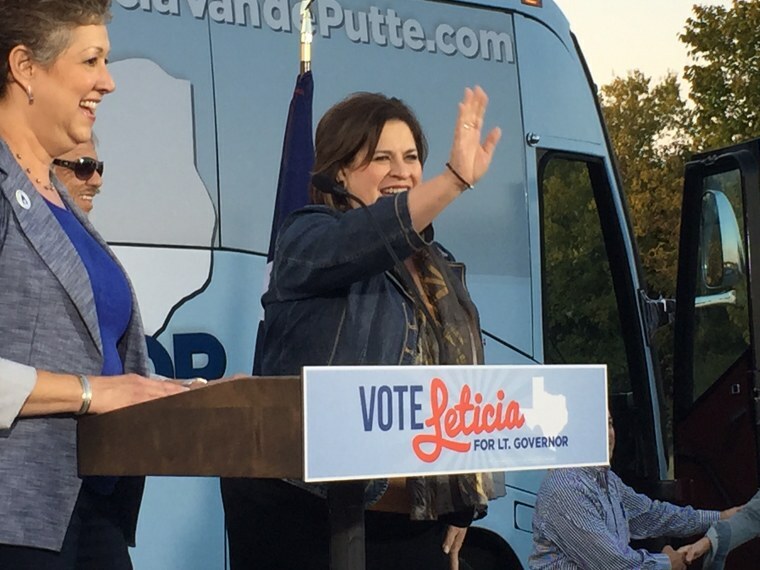 For Van de Putte, the win would add to a list of accomplishments. She has had a long career as a pharmacist and ran a flag manufacturing company that was started by her father and is now headed by her husband. She served in the Texas Legislature for 24 years. She was elected to the state House in 1991 and shifted to the Senate after being elected to a seat there in 1999. But she's had her setbacks. Last year, Van de Putte was the Democratic nominee for lieutenant governor, but only captured 40 percent of the vote in the election won by Dan Patrick. After first saying she would not seek the San Antonio mayor's job, Van de Putte changed her mind and entered the race. She shares some similarity with Taylor with that; Taylor had said she would not compete for the job in this year's election, but later decided she wanted to keep the job. In the runoff, Van de Putte led Taylor in the most votes, 31 percent to 28 percent. But because neither got a majority, they were thrown into a runoff. Flores said Van de Putte’s legislative track record and deep roots in Texas make her an appealing candidate. He also said running for lieutenant governor last year gave Van de Putte a leg up in name recognition. “She went into this election I think the heavy favorite,” Flores said. Taylor too, could achieve a milestone for the city, becoming its first black mayor. About 7 percent of the population is black. Born in Queens, New York, Taylor was the first in her family to attend college, according to her bio on her website. She moved to San Antonio for an internship and never left, working in the city's housing department and then in a non-profit that develops affordable housing. Walter Wilson, an associate political science professor at the University of Texas at San Antonio, said Van de Putte is better positioned to win than Taylor, given she has more established connections with community and business leaders, as well as more experience running a campaign and did better fundraising for the runoff. Despite Van de Putte's advantages, Wilson said he predicts a tight finish. Wilson explained that voter turnout is typically higher on the north side of San Antonio, where many conservative voters live, than in other parts of the city. That could work to Taylor’s advantage given some high-profile conservative stances she has taken, such as voting against a city ordinance that adds protections from discrimination based on a person’s gender identity and sexual orientation. In her short time in office, Taylor stopped a street car system that was a project of Castro's and forced a ballot measure that calls for a vote before such a system could be undertaken. When asked about her expectations of the race, Van de Putte said, “I think it’s going to be very close.” For that reason, she said she and her campaign team will work hard to get “every single vote that we can.” They plan to knock on doors and reach out to voters until 7 p.m. on election day. The Texas Tribune said insiders were giving the leg up to Taylor, although they described it as one that Van de Putte could overcome. The Tribune called Taylor the defacto Republican who took Van de Putte to task for fleeing the state in 2003 with other Democrats to shut down the Senate in protest of redistricting legislation. Taylor's campaign did not immediately respond Friday to phone calls and an email message requesting comment. During a June 1 debate, Taylor discussed her plans to provide more affordable housing, increase transportation options and make improvements to infrastructure. She also said she wants to help bring more businesses to San Antonio and improve workforce development. “These companies find San Antonio attractive, but if we don’t have people here who have the education and skills to fill the jobs that they’re creating, then ultimately it doesn’t matter if we provide incentives or we have great quality of life—their businesses can’t thrive here,” Taylor said. If elected mayor of San Antonio, Van de Putte said she will start off by resolving a collective bargaining dispute between the city of San Antonio and the police and fire unions. She also wants to bring companies, like Google Fiber, to the city and push for at least 75 percent of funds from a 2017 bond package to go toward improving the city’s infrastructure, like sidewalks, street lights and drainage. Van de Putte added that her “proven leadership” in the state legislature and her ability to work across the aisle to bring people together and “get things done” are some of the qualities she possesses that would make her a good mayor.